The World Ophthalmology Congress (WOC), a biennial international congress which started in 1857 when 150 ophthalmologists from 24 countries convened in Brussels, will take place in Cape Town in 2020. Previous countries to host WOC which takes place every two years include Abu Dhabi in 2012 and Japan in 2014. Mexico will be hosting the congress next year and Spain in 2018 before coming to Africa in 2020. It is estimated that over 20 000 delegates could attend. In what Dr Kgao Legodi describes as a tough bidding process, South Africa won the bid, surpassing submissions from Nigeria, Oman and Dubai. Legodi says it was an emotive bid, as Africa really does have so much to offer. 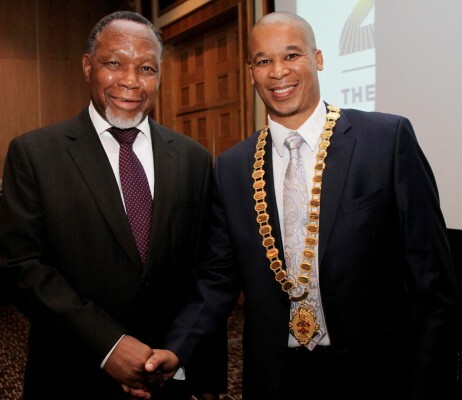 Further cementing their bid to host this prestigious congress was the fact that His Excellency Mr Kgalema Motlanthe, former president of South Africa, was late last year announced as the new Ambassador for VISION 2020: Sub Saharan Africa (see photo attached). Legodi says that besides this obvious alignment with Vision 2020, there are multiple reasons as to why they won the bid, including good security, religious diversity, abundant accommodation, straightforward visa regulations and state of art conference facilities at the Cape Town International Convention Centre. Legodi, the immediate past president of the Ophthalmological Society of South Africa (OSSA), led the delegation along with current OSSA president Dr Andrew Boliter, Prof Andries Stulting, Dr Johann Slazus, OSSA CEO Ms Merinda Moodie and Mr Adriaan Fourie from the Western Cape Convention Bureau (Wesgro). Legodi has wanted to enter the bidding process to host this event since 2011 when he says the seed was planted. After much research and the laying of groundwork, the time was right when he was appointed as president of OSSA last year. “This is a historic win for OSSA and Africa as a whole,” he says. “ We as OSSA feel that more than just offering international delegates the opportunity to attend the congress in 2020, this win affords them a once in a lifetime opportunity to enjoy Cape Town, South Africa and Sub-Saharan Africa all the while benefiting from shared learning amongst international peers”. “The exposure of the international ophthalmic community to the African continent and the economic impact of hosting a World Congress of this nature cannot be under-estimated,” says Legodi, who is understandably very excited about this opportunity which he has spearheaded. “More than a South African bid, this was an African bid. It’s time for Africa to star on its own,” he says. Testament to this is the support Legodi and his team has already received from neighbouring countries and ophthalmological societies including Ghana and the College of Ophthalmologists for Eastern, Central and Southern Africa (COECSA) who are committed to helping to make WOC 2020 a resounding success. “This is indeed a great challenge and one which Africa is committed to, and we will not only meet but exceed all expectations,” Legodi says the World Ophthalmology Congress President 2020.